Patients with malignant brain cancers such as glioblastoma and brain metastases (BM) represent a population with a large unmet medical need, and a multitude of drugs have failed over decades. The current treatment modalities include surgery, radiation, and chemotherapy; yet, the median survival of patients with gliomas and BM remains abysmally low at 15 months and 2–14 months, respectively. In addition, standard treatments cause debilitating motor and neurological deficits. The paucity of effective therapies, despite intense investigation over the past several decades, represents inherent challenges to treating brain cancer and the critical knowledge gap in understanding tumor sensitivity, drug delivery, and microenvironmental shifts. Recently, immunotherapy has shown tremendous efficacy in melanoma and other cancers but has yet to revolutionize the treatment of brain cancers. However, as immunotherapy holds the promise of specifically targeting and eliminating tumor cells while sparing normal brain cells, innovative methods for investigating immunotherapy for brain cancer are essential for optimizing patient response. In this review, we will summarize the key issues and how a systems biology approach can help decipher this complexity and lead to better understanding and therapeutic targeting of the brain cancers. Tumor molecular profiling has demonstrated promising results to guide treatment in various cancers,,,,,, and has revealed intratumoral and interpatient heterogeneity, with unique molecular characteristics present in most tumors., Furthermore, the selective pressures of treatment can alter tumor and microenvironment profiles over time. Clinical trials of targeted agents have largely been unsuccessful in unselected GBM patients, which emphasizes the need for ways of selecting patients who are more likely to respond to individualized treatments. It is increasingly apparent that this molecular diversity must be considered in clinical practice and clinical trial design, as well as the longitudinal changes that occur in tumors before, during, and after treatment. Articles referenced in this review were identified by literature search of relevant papers in PubMed using various terms including gliomas, microenvironment, and selected based on relevance to narrow focus of this review. The brain tumor microenvironment (TME) is a critical regulator of the response and resistance to therapies in both primary and metastatic brain malignancies. A comprehensive understanding of the TME landscape, including tumor heterogeneity, blood–brain barrier (BBB) dynamics, and immunosuppression, is needed to identify new therapeutic strategies and understand the mechanisms of treatment resistance. In addition, tumor cell invasion and treatment-related neurotoxicity need better management. Genomic analyses performed on a large data cohort from the Cancer Genome Atlas More Details (TCGA) revealed the biological complexity of somatic alterations associated with GBM., RNA sequencing, DNA copy number, transcriptomics, DNA methylation aberrations, and proteomic profiling have all been used to characterize and stratify subclasses of GBM that drive clinical prognoses,,,, and efforts continue to identify molecular subtypes that affect the sensitivity of individual tumors to treatment and subsequent clinical outcome.,, Not only do varied genetic drivers of GBM exist, but also oftentimes the involvement of multiple or compensatory molecular pathways leads to the development of drug resistance. Expanded tumor profiling has revealed intratumor heterogeneity as well as interpatient heterogeneity, with most patients having tumors with unique molecular alterations., Individual efforts have generated molecular profiles of BM, mostly involving gene sequencing,,, gene expression, DNA methylation, and combinations of these methods,,,, and additional large-scale projects are needed that can advance our understanding of the BM landscape. The BBB is a highly selective, semipermeable structure along the cerebral microvasculature that is responsible for maintaining brain homeostasis and protecting the central nervous system (CNS) from harmful substances in circulating blood. Drug delivery to treat brain cancer has been hindered by the BBB's physical barrier and efflux pumps that actively transport substances out of the brain. Several strategies are being developed to circumvent this barrier, but an important question to address is whether immunotherapies that boost adaptive immunity must penetrate the BBB to exert their therapeutic effect or if activity in peripheral components of the immune system such as the lymph nodes is sufficient. Evading immune surveillance is one of the hallmarks of cancers; it develops out of an intricate cross-talk between the immune system, cancer cells, and normal stromal cells that can both inhibit and enhance tumor growth. GBM and BM produce immunosuppressive cytokines inhibit effector T-cell recognition, proliferation, and function; increase T-cell apoptosis; activate regulatory T cells; and polarize microglia and tumor-associated macrophages toward an immunosuppressive phenotype.,,,, Malignant brain tumors also subvert the immune system by downregulating major histocompatibility complex expression and antigen presentation, as well as capitalizing on immune checkpoint pathways to dampen antitumor activities.,, Successful immunotherapy will depend on targeting these strategies for immune evasion and elucidating changes in the molecular state of the TME that occur due to different treatments, with the ultimate goal of enabling the rational design of combination therapy to target complementary pathways. Although the benefits of radiation and chemotherapy far outweigh the risk for most people at this time, treatment can lead to temporary or permanent cognitive decline and decreased quality of life.,, Radiotherapy is indiscriminate in damaging tumors, tumor/peritumoral microvasculature, normal brain white matter, the hippocampus, and prefrontal cortex., Over half of the patients who receive brain radiation and survive beyond 6 months exhibit progressive cognitive impairment and other symptoms.,,,,, Not only does radiation therapy adversely affect normal brain function but it can also promote tumor recurrence with a more aggressive phenotype., Finding alternate treatments to delay or circumvent radiation therapy would significantly impact patients' quality of life. While there is no doubt that radiation and temozolomide have conferred a survival advantage and has been the cornerstone of therapies for most malignant brain cancers, the fact remains that significant improvements in patient survival and quality of life are still desperately needed. In addition to developing more efficacious treatments, a deeper understanding of the pharmacodynamic and pharmacogenetic interplay between treatments and tumors is needed to help physicians make informed treatment decisions throughout a patient's disease. Despite the past 20 years of focused efforts on brain cancers, from basic biology to clinical trials, substantial progress has not been made in improving patient outcomes. The reasons are varied, but one central reason is that clinical trials should be performed earlier in the disease course where novel treatments, especially immunological approaches, can have the maximal benefit before chemotherapy or radiation negatively impact the immune system and TME. Preirradiation treatment (neoadjuvant therapy) is also advantageous to treat micrometastatic lesions much earlier than conventional adjuvant therapy, as well as to identify truly active or ineffective therapeutic regimens early. With the development of new approaches to treat early stage-brain tumors, it becomes more important to have better early detection methods that can be carried out, repetitively. The early detection of small lesions allows the implementation of endoscopic surgery, focused radiotherapies, and new therapeutics such as small molecule inhibitors and checkpoint inhibitors. Liquid (blood) biopsy for circulating biomarkers offers an important tool not only to detect brain tumors early but also to monitor progression and treatment responses in real time. To date, there has been little progress in this field primarily due to limited molecular biomarkers and multiomics analysis. Since brain tumors such as BMs GBMs have a limited number of mutations, changes in other cell-free nucleic acids, proteins, and metabolites must be profiled to obtain a comprehensive and sensitive detection system. However, a holistic approach is required to analyze these complex, heterogeneous multiomic datasets to discover indicators of perturbed networks that can be mined for biomarkers together with other clinical demographics. A systems biology approach of integrating new analytical tools and computational modeling for innovative solutions is novel and elevates the traditional single biomarker and single platform assay analysis such as that found in the standard development of liquid biopsies. Several approaches have been proposed to reduce recurrence rates and drug resistance, such as targeting stem-like cells, dual therapy for long-term disease control, and therapy with synergistic drug combinations.,,,,,,,,, Therefore, a growing number of clinical trials are investigating multiple drug combinations for the treatment of GBM (e.g., ClinicalTrials.gov identifier: NCT01430351). However, the number of possible drug combinations is too large to screen effectively. Moreover, not all drug combinations are likely to be effective against all patient tumors. A gene network-based strategy, which utilizes information regarding the complex mechanisms underlying tumor biology elucidated by systems-type analyses of tumors, is necessary to accelerate the discovery of drug combinations that have a higher likelihood of acting synergistically against the unique vulnerabilities of a specific patient(s) tumor. 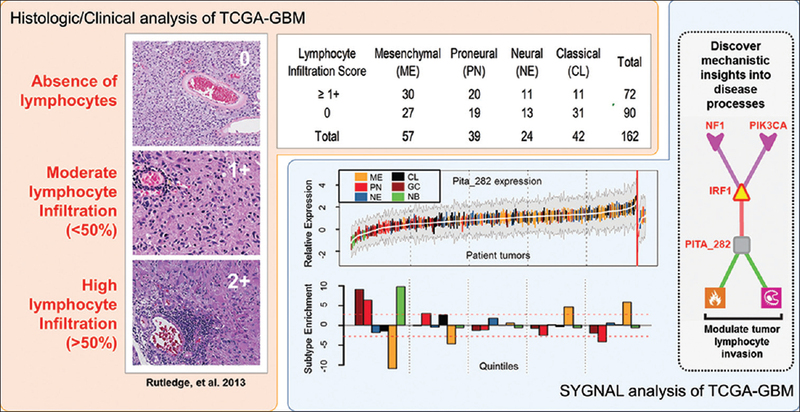 For example, we have performed systems genetics network analysis [SYGNAL; [Figure 1]a and [Figure 1]b of multiomics GBM data from TCGA to generate an omic-scale predictive network model (gbmSYGNAL) that delineates how specific genetic and non-genetic mechanisms mechanistically alter gene networks governing oncogenic processes across tumors. For example, using gbmSYGNAL, we have identified a putative mechanism in which GBM tumors with NF1 and PIK3C mutations have increased lymphocyte infiltration [Figure 2]. Similarly, we have demonstrated how gbmSYGNAL can be used to infer molecular targets (e.g., miRNA targets) that can be perturbed to increase drug efficacy [Figure 1]c and [Figure 1]d. This model, together with multiscale computational and experimental models that evaluate events occurring over distinct spatial and temporal levels, will uncover multiple vulnerabilities across heterogeneous tumor populations to discover combination therapies effective against the unique characteristics of a patient's tumor and the cell subpopulations within an individual tumor. Although genomic studies have improved our understanding of gliomas and BM, extensive clinical strides have not been made using immunotherapy. Using the immune system to specifically target brain tumors have been tried over the past two decades including vaccines, antibodies, viruses, checkpoint inhibitors, and more recently CAR-T cells,,,,,,,,,, with the recent failure of nivolumab to increase overall survival in patients with recurrent GBM. One confounding issue is that most clinical trials are conducted in the recurrent disease setting, where the immune system is already damaged and has less chance of responding. Understanding the polar responses to immunotherapy, where either too little immune modulation (e.g. vaccines) or too much (e.g. checkpoint inhibitors) occurs, and identifying a middle ground, as well as managing CNS side effects without compromising the tumor-specific immune response, will be key to the future success of immune-based therapies for brain cancers.,,,,, Furthermore, the realization that the tumor and its microenvironment are moving targets that evolve over time necessitates longitudinal studies in patients. Tumor responses with immunotherapies have been observed in patients with BM from melanoma and lung cancer.,,, Results from the Phase II Checkmate-204 clinical trial of nivolumab plus ipilimumab for patients with asymptomatic melanoma brain metastases (MBM) showed a favorable safety profile and high intracranial antitumor activity, with clinical benefit of 57% including complete responses in 26% of patients., A separate Phase II study of ipilimumab monotherapy in patients with MBM identified differences in the intracranial disease control rate between asymptomatic patients without corticosteroids (25%) and symptomatic patients requiring corticosteroids (10%). The durable response seen in cases of recurrent GBM arising from biallelic mismatch repair deficiency treated with nivolumab is also encouraging for hypermutant cancers. Initial results from the Phase II Checkmate-143 clinical trial of nivolumab for patients with recurrent GBM encouraged continued testing on a Phase III cohort. Although the study did not culminate with significantly increased survival, the larger implication is that immunotherapy has the potential to deliver responses to some patients with brain cancer and identifying those determinants is imperative. These successes and failures of immune checkpoint inhibition in patients with primary and secondary brain cancer suggest underlying characteristics predisposing each tumor to immunotherapy responsiveness. Much remains unknown of what these individual tumor characteristics are; therefore, it is critical to identify the determinants of response that can help develop and select the most effective therapies for each individual patient, leading to a new type of trial, an n = 1 trial. The concept of n = 1 trials is misleading as by definition it is statistically underpowered. However, by leveraging multiomics data from large cohorts, it is feasible to reverse engineer the ensemble of networks that are perturbed in brain cancer and identify what subnetworks may be enriched across different patient subgroups, as we have done using the gbmSYGNAL network [Figure 1]b. Thereafter, multiomics profiles of an individual patient can be mapped on to this network to identify the unique set of genetic and nongenetic mechanisms that have become dysfunctional to drive oncogenic processes in their tumors. In other words, the network-based approach enables the mapping of patients to complex, dysfunctional networks delineated by the gbmSYGNAL network model, which enables the identification of potential regulatory mechanisms that may be targeted to specific therapies that have a higher likelihood of being effective. In fact, screens using patient-derived GBM cell lines can then be used to find drug combinations that might synergize only in the context of the unique dysfunctional mechanisms of that patient's tumor, thereby motivating an n = 1 type trial. To better serve patients with brain cancer, new clinical trial designs that incorporate advanced genomics and other methodologies to interrogate tumor biology and the TME could enable rationally designed, customized treatment combinations early in the treatment course. The provision of biological specimens centered on treatments administered before radiation would lead to a more undisturbed, comprehensive profile evaluation to address questions regarding the individualistic biological effects of treatment, how many signals or pathways need to be targeted, and what possible mechanisms of drug resistance and lack of durable response emerge. In the era of genomics and immune-oncology, precision and systems medicine is clearly needed to optimize treatments for each patient (n = 1). We need to learn from every patient-treatment pairing to improve our understanding of the underlying causes of the variability in patient response. We need to carefully look at the impact of immune therapy before the immune system/TME is altered by radiation and chemotherapy and do so in a longitudinal fashion. Not only will there be a broader and deeper understanding of the TME, but this will also help us will help us design new therapeutic strategies to transform the outcomes of brain cancers. Articles referenced in this review were identified by literature search of relevant papers in PubMed using various terms including gliomas, GBM, immunotherapy, checkpoint inhibitors, BM, TME, and others selected based on relevance to narrow focus of this review. Chukwueke U, Batchelor T, Brastianos P. Management of brain metastases in patients with melanoma. J Oncol Pract 2016;12:536-42. Vos T, Flaxman AD, Naghavi M, Lozano R, Michaud C, Ezzati M, et al. Years lived with disability (YLDs) for 1160 sequelae of 289 diseases and injuries 1990-2010: A systematic analysis for the Global Burden of Disease Study 2010. Lancet 2012;380:2163-96. Gaspar LE, Scott C, Murray K, Curran W. Validation of the RTOG recursive partitioning analysis (RPA) classification for brain metastases. Int J Radiat Oncol Biol Phys 2000;47:1001-6. Sperduto PW, Kased N, Roberge D, Xu Z, Shanley R, Luo X et al. Summary report on the graded prognostic assessment: An accurate and facile diagnosis-specific tool to estimate survival for patients with brain metastases. J Clin Oncol 2012; 30:419-425. Johnson LA, Scholler J, Ohkuri T, Kosaka A, Patel PR, McGettigan SE, et al. Rational development and characterization of humanized anti-EGFR variant III chimeric antigen receptor T cells for glioblastoma. Sci Transl Med 2015;7:275ra22. Neagu MR, Reardon DA. An update on the role of immunotherapy and vaccine strategies for primary brain tumors. Curr Treat Options Oncol 2015;16:54. Brown CE, Alizadeh D, Starr R, Weng L, Wagner JR, Naranjo A, et al. Regression of glioblastoma after chimeric antigen receptor T-cell therapy. N Engl J Med 2016;375:2561-9. Lin Y, Okada H. Cellular immunotherapy for malignant gliomas. Expert Opin Biol Ther 2016;16:1265-75. Shiina S, Ohno M, Ohka F, Kuramitsu S, Yamamichi A, Kato A, et al. CAR T cells targeting podoplanin reduce orthotopic glioblastomas in mouse brains. Cancer Immunol Res 2016;4:259-68. Rodriguez A, Brown C, Badie B. Chimeric antigen receptor T-cell therapy for glioblastoma. Transl Res 2017;187:93-102. Han J, Chu J, Keung Chan W, Zhang J, Wang Y, Cohen JB, et al. CAR-engineered NK cells targeting wild-type EGFR and EGFRvIII enhance killing of glioblastoma and patient-derived glioblastoma stem cells. Sci Rep 2015;5:11483. Maxwell R, Jackson CM, Lim M. Clinical trials investigating immune checkpoint blockade in glioblastoma. Curr Treat Options Oncol 2017;18:51. Weller M, Roth P, Preusser M, Wick W, Reardon DA, Platten M, et al. Vaccine-based immunotherapeutic approaches to gliomas and beyond. Nat Rev Neurol 2017;13:363-74. Srinivasan VM, Ferguson SD, Lee S, Weathers SP, Kerrigan BCP, Heimberger AB, et al. Tumor vaccines for malignant gliomas. Neurotherapeutics 2017;14:345-57. Weller M, Butowski N, Tran DD, Recht LD, Lim M, Hirte H, et al. Rindopepimut with temozolomide for patients with newly diagnosed, EGFRvIII-expressing glioblastoma (ACT IV): A randomised, double-blind, international phase 3 trial. Lancet Oncol 2017;18:1373-85. Zhu X, McDowell MM, Newman WC, Mason GE, Greene S, Tamber MS, et al. Severe cerebral edema following nivolumab treatment for pediatric glioblastoma: Case report. J Neurosurg Pediatr 2017;19:249-53. Slamon DJ, Leyland-Jones B, Shak S, Fuchs H, Paton V, Bajamonde A, et al. Use of chemotherapy plus a monoclonal antibody against HER2 for metastatic breast cancer that overexpresses HER2. N Engl J Med 2001;344:783-92. Druker BJ, Guilhot F, O'Brien SG, Gathmann I, Kantarjian H, Gattermann N, et al. Five-year follow-up of patients receiving imatinib for chronic myeloid leukemia. N Engl J Med 2006;355:2408-17. Febbo PG, Ladanyi M, Aldape KD, De Marzo AM, Hammond ME, Hayes DF, et al. NCCN task force report: Evaluating the clinical utility of tumor markers in oncology. J Natl Compr Canc Netw 2011;9 Suppl 5:S1-32. Tsimberidou AM, Iskander NG, Hong DS, Wheler JJ, Falchook GS, Fu S, et al. Personalized medicine in a phase I clinical trials program: The MD anderson cancer center initiative. Clin Cancer Res 2012;18:6373-83. Jameson GS, Petricoin EF, Sachdev J, Liotta LA, Loesch DM, Anthony SP, et al. A pilot study utilizing multi-omic molecular profiling to find potential targets and select individualized treatments for patients with previously treated metastatic breast cancer. Breast Cancer Res Treat 2014;147:579-88. Tsimberidou AM, Eggermont AM, Schilsky RL. Precision cancer medicine: The future is now, only better. Am Soc Clin Oncol Educ Book 2014;61-9. Gerlinger M, Rowan AJ, Horswell S, Math M, Larkin J, Endesfelder D, et al. Intratumor heterogeneity and branched evolution revealed by multiregion sequencing. N Engl J Med 2012;366:883-92. Patel SP, Schwaederle M, Daniels GA, Fanta PT, Schwab RB, Shimabukuro KA, et al. Molecular inimitability amongst tumors: Implications for precision cancer medicine in the age of personalized oncology. Oncotarget 2015;6:32602-9. Xiu J, Piccioni D, Juarez T, Pingle SC, Hu J, Rudnick J, et al. Multi-platform molecular profiling of a large cohort of glioblastomas reveals potential therapeutic strategies. Oncotarget 2016;7:21556-69. Quail DF, Joyce JA. The microenvironmental landscape of brain tumors. Cancer Cell 2017;31:326-41. Cancer Genome Atlas Research Network. 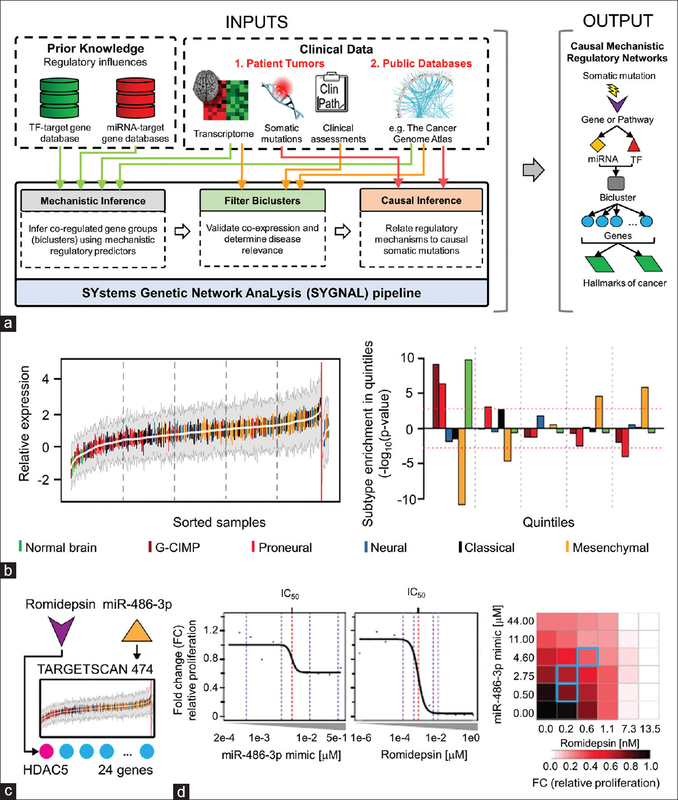 Comprehensive genomic characterization defines human glioblastoma genes and core pathways. Nature 2008;455:1061-8. Brennan CW, Verhaak RG, McKenna A, Campos B, Noushmehr H, Salama SR, et al. The somatic genomic landscape of glioblastoma. Cell 2013;155:462-77. Mischel PS, Shai R, Shi T, Horvath S, Lu KV, Choe G, et al. Identification of molecular subtypes of glioblastoma by gene expression profiling. Oncogene 2003;22:2361-73. Liang Y, Diehn M, Watson N, Bollen AW, Aldape KD, Nicholas MK, et al. Gene expression profiling reveals molecularly and clinically distinct subtypes of glioblastoma multiforme. Proc Natl Acad Sci U S A 2005;102:5814-9. Maher EA, Brennan C, Wen PY, Durso L, Ligon KL, Richardson A, et al. Marked genomic differences characterize primary and secondary glioblastoma subtypes and identify two distinct molecular and clinical secondary glioblastoma entities. Cancer Res 2006;66:11502-13. Noushmehr H, Weisenberger DJ, Diefes K, Phillips HS, Pujara K, Berman BP, et al. Identification of a cpG Island methylator phenotype that defines a distinct subgroup of glioma. Cancer Cell 2010;17:510-22. Verhaak RG, Hoadley KA, Purdom E, Wang V, Qi Y, Wilkerson MD, et al. Integrated genomic analysis identifies clinically relevant subtypes of glioblastoma characterized by abnormalities in PDGFRA, IDH1, EGFR, and NF1. Cancer Cell 2010;17:98-110. Crespo I, Vital AL, Gonzalez-Tablas M, Patino Mdel C, Otero A, Lopes MC, et al. Molecular and genomic alterations in glioblastoma multiforme. Am J Pathol 2015;185:1820-33. Furnari FB, Cloughesy TF, Cavenee WK, Mischel PS. Heterogeneity of epidermal growth factor receptor signalling networks in glioblastoma. Nat Rev Cancer 2015;15:302-10. Brastianos PK, Carter SL, Santagata S, Cahill DP, Taylor-Weiner A, Jones RT, et al. Genomic characterization of brain metastases reveals branched evolution and potential therapeutic targets. Cancer Discov 2015;5:1164-77. Lee JY, Park K, Lim SH, Kim HS, Yoo KH, Jung KS, et al. Mutational profiling of brain metastasis from breast cancer: Matched pair analysis of targeted sequencing between brain metastasis and primary breast cancer. Oncotarget 2015;6:43731-42. Ferguson SD, Zheng S, Xiu J, Zhou S, Khasraw M, Brastianos PK, et al. Profiles of brain metastases: Prioritization of therapeutic targets. Int J Cancer 2018. Priedigkeit N, Hartmaier RJ, Chen Y, Vareslija D, Basudan A, Watters RJ, et al. Intrinsic subtype switching and acquired ERBB2/HER2 amplifications and mutations in breast cancer brain metastases. JAMA Oncol 2017;3:666-71. Orozco JI, Knijnenburg TA, Manughian-Peter AO, Salomon MP, Barkhoudarian G, Jalas JR, et al. Epigenetic profiling for the molecular classification of metastatic brain tumors. bioRxiv; 2018. Marzese DM, Huynh JL, Kawas NP, Hoon DS. Multi-platform genome-wide analysis of melanoma progression to brain metastasis. Genom Data 2014;2:150-2. Marzese DM, Scolyer RA, Huynh JL, Huang SK, Hirose H, Chong KK, et al. Epigenome-wide DNA methylation landscape of melanoma progression to brain metastasis reveals aberrations on homeobox D cluster associated with prognosis. Hum Mol Genet 2014;23:226-38. Marzese DM, Scolyer RA, Roqué M, Vargas-Roig LM, Huynh JL, Wilmott JS, et al. DNA methylation and gene deletion analysis of brain metastases in melanoma patients identifies mutually exclusive molecular alterations. Neuro Oncol 2014;16:1499-509. Chen G, Chakravarti N, Aardalen K, Lazar AJ, Tetzlaff MT, Wubbenhorst B, et al. Molecular profiling of patient-matched brain and extracranial melanoma metastases implicates the PI3K pathway as a therapeutic target. Clin Cancer Res 2014;20:5537-46. Hanahan D, Weinberg RA. Hallmarks of cancer: The next generation. Cell 2011;144:646-74. Chahlavi A, Rayman P, Richmond AL, Biswas K, Zhang R, Vogelbaum M, et al. Glioblastomas induce T-lymphocyte death by two distinct pathways involving gangliosides and CD70. Cancer Res 2005;65:5428-38. Wischhusen J, Schneider D, Mittelbronn M, Meyermann R, Engelmann H, Jung G, et al. Death receptor-mediated apoptosis in human malignant glioma cells: Modulation by the CD40/CD40L system. J Neuroimmunol 2005;162:28-42. Razavi SM, Lee KE, Jin BE, Aujla PS, Gholamin S, Li G, et al. Immune evasion strategies of glioblastoma. Front Surg 2016;3:11. Hinton CV, Avraham S, Avraham HK. Role of the CXCR4/CXCL12 signaling axis in breast cancer metastasis to the brain. Clin Exp Metastasis 2010;27:97-105. Lee BC, Lee TH, Avraham S, Avraham HK. Involvement of the chemokine receptor CXCR4 and its ligand stromal cell-derived factor 1alpha in breast cancer cell migration through human brain microvascular endothelial cells. Mol Cancer Res 2004;2:327-38. Zagzag D, Salnikow K, Chiriboga L, Yee H, Lan L, Ali MA, et al. Downregulation of major histocompatibility complex antigens in invading glioma cells: Stealth invasion of the brain. Lab Invest 2005;85:328-41. Magnus T, Schreiner B, Korn T, Jack C, Guo H, Antel J, et al. Microglial expression of the B7 family member B7 homolog 1 confers strong immune inhibition: Implications for immune responses and autoimmunity in the CNS. J Neurosci 2005;25:2537-46. Bloch O, Crane CA, Kaur R, Safaee M, Rutkowski MJ, Parsa AT, et al. Gliomas promote immunosuppression through induction of B7-H1 expression in tumor-associated macrophages. Clin Cancer Res 2013;19:3165-75. Sahebjam S, Ramkissoon S, Baehring JM, Mulholland PJ, Grauer OM, Cloughesy TF, et al. Histopathologic review of suspected disease progression in patients with recurrent glioblastoma (GBM) receiving nivolumab±ipilimumab: CheckMate 143. J Clin Oncol 2017;35:2001. Dietrich J, Rao K, Pastorino S, Kesari S. Corticosteroids in brain cancer patients: Benefits and pitfalls. Expert Rev Clin Pharmacol 2011;4:233-42. Franchimont D, Galon J, Gadina M, Visconti R, Zhou Y, Aringer M, et al. Inhibition of th1 immune response by glucocorticoids: Dexamethasone selectively inhibits IL-12-induced stat4 phosphorylation in T lymphocytes. J Immunol 2000;164:1768-74. Cifone MG, Migliorati G, Parroni R, Marchetti C, Millimaggi D, Santoni A, et al. Dexamethasone-induced thymocyte apoptosis: Apoptotic signal involves the sequential activation of phosphoinositide-specific phospholipase C, acidic sphingomyelinase, and caspases. Blood 1999;93:2282-96. Herold MJ, McPherson KG, Reichardt HM. Glucocorticoids in T cell apoptosis and function. Cell Mol Life Sci 2006;63:60-72. Baschant U, Tuckermann J. The role of the glucocorticoid receptor in inflammation and immunity. J Steroid Biochem Mol Biol 2010;120:69-75. Burger PC, Mahley MS Jr., Dudka L, Vogel FS. The morphologic effects of radiation administered therapeutically for intracranial gliomas: A postmortem study of 25 cases. Cancer 1979;44:1256-72. Giese A, Westphal M. Treatment of malignant glioma: A problem beyond the margins of resection. J Cancer Res Clin Oncol 2001;127:217-25. Petrecca K, Guiot MC, Panet-Raymond V, Souhami L. Failure pattern following complete resection plus radiotherapy and temozolomide is at the resection margin in patients with glioblastoma. J Neurooncol 2013;111:19-23. Dietrich J, Kesari S. Effect of cancer treatment on neural stem and progenitor cells. Cancer Treat Res 2009;150:81-95. Makale MT, McDonald CR, Hattangadi-Gluth JA, Kesari S. Mechanisms of radiotherapy-associated cognitive disability in patients with brain tumours. Nat Rev Neurol 2017;13:52-64. Dietrich J, Prust M, Kaiser J. Chemotherapy, cognitive impairment and hippocampal toxicity. Neuroscience 2015;309:224-32. Sheline GE, Wara WM, Smith V. Therapeutic irradiation and brain injury. Int J Radiat Oncol Biol Phys 1980;6:1215-28. Greene-Schloesser D, Robbins ME, Peiffer AM, Shaw EG, Wheeler KT, Chan MD, et al. Radiation-induced brain injury: A review. Front Oncol 2012;2:73. Salazar OM, Rubin P, Feldstein ML, Pizzutiello R. High dose radiation therapy in the treatment of malignant gliomas: Final report. Int J Radiat Oncol Biol Phys 1979;5:1733-40. Schiffer D, Giordana MT, Soffietti R, Tarenzi L, Milani R, Vasario E, et al. Radio- and chemotherapy of malignant gliomas. Pathological changes in the normal nervous tissue. Acta Neurochir (Wien) 1981;58:37-58. Erson-Omay EZ, Henegariu O, Omay SB, Harmancı AS, Youngblood MW, Mishra-Gorur K, et al. Longitudinal analysis of treatment-induced genomic alterations in gliomas. Genome Med 2017;9:12. Hill BT, Shellard SA, Hosking LK, Fichtinger-Schepman AM, Bedford P. Enhanced DNA repair and tolerance of DNA damage associated with resistance to cis-diammine-dichloroplatinum (II) after in vitro exposure of a human teratoma cell line to fractionated X-irradiation. Int J Radiat Oncol Biol Phys 1990;19:75-83. Miao H, Choi BD, Suryadevara CM, Sanchez-Perez L, Yang S, De Leon G, et al. EGFRvIII-specific chimeric antigen receptor T cells migrate to and kill tumor deposits infiltrating the brain parenchyma in an invasive xenograft model of glioblastoma. PLoS One 2014;9:e94281. Shaffer SM, Dunagin MC, Torborg SR, Torre EA, Emert B, Krepler C, et al. Rare cell variability and drug-induced reprogramming as a mode of cancer drug resistance. Nature 2017;546:431-5. Alizadeh AA, Aranda V, Bardelli A, Blanpain C, Bock C, Borowski C, et al. Toward understanding and exploiting tumor heterogeneity. Nat Med 2015;21:846-53. Lee JK, Wang J, Sa JK, Ladewig E, Lee HO, Lee IH, et al. Spatiotemporal genomic architecture informs precision oncology in glioblastoma. Nat Genet 2017;49:594-9. Sokratous G, Polyzoidis S, Ashkan K. Immune infiltration of tumor microenvironment following immunotherapy for glioblastoma multiforme. Hum Vaccin Immunother 2017;13:2575-82. Berghoff AS, Preusser M. The inflammatory microenvironment in brain metastases: Potential treatment target? Chin Clin Oncol 2015;4:21. Bozic I, Reiter JG, Allen B, Antal T, Chatterjee K, Shah P, et al. Evolutionary dynamics of cancer in response to targeted combination therapy. Elife 2013;2:e00747. Kemper K, Grandela C, Medema JP. Molecular identification and targeting of colorectal cancer stem cells. Oncotarget 2010;1:387-95. Curtin JC, Lorenzi MV. Drug discovery approaches to target wnt signaling in cancer stem cells. Oncotarget 2010;1:563-77. Liu D, Martin V, Fueyo J, Lee OH, Xu J, Cortes-Santiago N, et al. Tie2/TEK modulates the interaction of glioma and brain tumor stem cells with endothelial cells and promotes an invasive phenotype. Oncotarget 2010;1:700-9. Di J, Duiveman-de Boer T, Figdor CG, Torensma R. Eradicating cancer cells: Struggle with a chameleon. Oncotarget 2011;2:99-101. Velpula KK, Dasari VR, Tsung AJ, Dinh DH, Rao JS. Cord blood stem cells revert glioma stem cell EMT by down regulating transcriptional activation of so×2 and twist1. Oncotarget 2011;2:1028-42. Lu KV, Chang JP, Parachoniak CA, Pandika MM, Aghi MK, Meyronet D, et al. VEGF inhibits tumor cell invasion and mesenchymal transition through a MET/VEGFR2 complex. Cancer Cell 2012;22:21-35. Yuan S, Wang F, Chen G, Zhang H, Feng L, Wang L, et al. Effective elimination of cancer stem cells by a novel drug combination strategy. Stem Cells 2013;31:23-34. Luchman HA, Stechishin OD, Nguyen SA, Lun XQ, Cairncross JG, Weiss S, et al. Dual mTORC1/2 blockade inhibits glioblastoma brain tumor initiating cells in vitro and in vivo and synergizes with temozolomide to increase orthotopic xenograft survival. Clin Cancer Res 2014;20:5756-67. Jiang P, Mukthavaram R, Chao Y, Bharati IS, Fogal V, Pastorino S, et al. Novel anti-glioblastoma agents and therapeutic combinations identified from a collection of FDA approved drugs. J Transl Med 2014;12:13. Plaisier CL, O'Brien S, Bernard B, Reynolds S, Simon Z, Toledo CM, et al. Causal mechanistic regulatory network for glioblastoma deciphered using systems genetics network analysis. Cell Syst 2016;3:172-86. Rutledge WC, Kong J, Gao J, Gutman DA, Cooper LA, Appin C, et al. Tumor-infiltrating lymphocytes in glioblastoma are associated with specific genomic alterations and related to transcriptional class. Clin Cancer Res 2013;19:4951-60. Chamberlain MC, Kim BT. Nivolumab for patients with recurrent glioblastoma progressing on bevacizumab: A retrospective case series. J Neurooncol 2017;133:561-9. Nesselhut J, Marx D, Cillien N, Chang RY, Brockmann WP, Martin M, et al. Comparison of early versus late onset of cellular immunotherapy in glioblastoma multiforme WHO IV. J Clin Oncol 2017;35:e13531. Bouffet E, Larouche V, Campbell BB, Merico D, de Borja R, Aronson M, et al. Immune checkpoint inhibition for hypermutant glioblastoma multiforme resulting from germline biallelic mismatch repair deficiency. J Clin Oncol 2016;34:2206-11. Reardon DA, Sampson JH, Sahebjam S, Lim M, Baehring JM, Vlahovic G, et al. Safety and activity of nivolumab (NIVO) monotherapy and NIVO in combination with ipilimumab (IPI) in recurrent glioblastoma (GBM): Updated results from checkmate-143. J Clin Oncol 2016;34:2014. Sampson JH, Vlahovic G, Sahebjam S, Omuro AM, Baehring JM, Hafler DA, et al. Preliminary safety and activity of nivolumab and its combination with ipilimumab in recurrent glioblastoma (GBM): CHECKMATE-143. J Clin Oncol 2015;33:3010. Sampson JH, Omuro AM, Preusser M, Lim M, Butowski NA, Cloughesy TF, et al. A randomized, phase 3, open-label study of nivolumab versus temozolomide (TMZ) in combination with radiotherapy (RT) in adult patients (PTS) with newly diagnosed, O-6-methylguanine DNA methyltransferase (MGMT)-unmethylated glioblastoma (GBM): CheckMate-498. J Clin Oncol 2016;34:TPS2079. Margolin K, Ernstoff MS, Hamid O, Lawrence D, McDermott D, Puzanov I, et al. Ipilimumab in patients with melanoma and brain metastases: An open-label, phase 2 trial. Lancet Oncol 2012;13:459-65. Goldberg SB, Gettinger SN, Mahajan A, Chiang AC, Herbst RS, Sznol M, et al. Pembrolizumab for patients with melanoma or non-small-cell lung cancer and untreated brain metastases: Early analysis of a non-randomised, open-label, phase 2 trial. Lancet Oncol 2016;17:976-83. Parakh S, Park JJ, Mendis S, Rai R, Xu W, Lo S, et al. Efficacy of anti-PD-1 therapy in patients with melanoma brain metastases. Br J Cancer 2017;116:1558-63. Tawbi HA, Forsyth PA, Algazi AP, Hamid O, Hodi FS, Moschos SJ, et al. Efficacy and safety of nivolumab (NIVO) plus ipilimumab (IPI) in patients with melanoma (MEL) metastatic to the brain: Results of the phase II study CheckMate 204. J Clin Oncol 2017;Suppl:9507. Tawbi HA, Forsyth PA, Algazi A, Hamid O, Hodi FS, Moschos SJ, et al. Combined nivolumab and ipilimumab in melanoma metastatic to the brain. N Engl J Med 2018;379:722-30.